Blue Wave? How about a Red Ebb? High voter turnout – the biggest in a century for a midterm election – disproportionately favored Democrats in 11 competitive Senate races. Republicans stayed home, like voters usually do when there isn’t a presidential contest. Democrats, on the other hand, voted in numbers like 2016 and actually increased their turnout in small cities and rural counties. Was there a blue wave in this year’s election? Or is it more accurate to say there was a red ebb? To put the question less metaphorically, did Democrats gain traction this year because of a turnout of voters, or were their successes more a result of Republicans staying home on Election Day? As with most things, the answers depend on your perspective. University of Maryland political scientist James Gimpel says there is a normal “surge and decline” in voter turnout – a surge of voters in presidential years and a decline in the off years. This year was a midterm election, and so a decline was to be expected. But the normally large falloff in voting was muted in 2018. Political scientist Michael McDonald keeps track of voter turnout and he finds that the “decline” in votes for this midterm election appears to have been about half of the normal drop. But the decline was not symmetrical. Republican votes were down from 2016 to a far greater degree than the Democrats. We don’t have complete vote totals for the nation, so we compared votes from 2018’s most hotly contested Senate races to the votes in the same states in the 2016 presidential contest. In those 11 states, the Democratic vote total was down just half of a percent from 2016. Democratic voters showed up – the blue wave. Meanwhile, the Republican vote totals were off by 17.1 percent from 2016 totals. That’s the red ebb. Nationally, a good deal of this shift was driven by the vote in rural America. Although rural America accounted for only 13.6 percent of the total vote in these hot senate races, rural places produced 25 percent of the Republicans’ voting decline. Democrats lost votes from 2016, too, but these losses were entirely in the central counties of metropolitan areas. In rural counties and in small cities (under 250,000 people), the Democratic totals increased in these 11 states over 2016. And overall, Democratic vote totals came within a half a percentage point of 2016 totals. The story was slightly different in Texas, where Democrat Beto O’Rourke came within a few percentage points of beating incumbent Senator Ted Cruz. O’Rourke made a point of visiting each of Texas’ 254 counties, and his strategy of appealing to both rural and urban voters has helped make him an early presidential contender for 2020. But O’Rourke’s attraction was primarily an urban phenomenon. He gained votes in the state’s major metro regions over Hillary Clinton’s totals in 2016. But he earned fewer votes than Clinton in rural areas. O’Rourke’s gains in the large cities increased his vote above the Democratic totals from 2016 — the blue wave — but he was also helped by a 9.4 percent red ebb in the Republican vote from what Donald Trump gathered in Texas two years ago. While other Democratic senate candidates made impressive double-digit gains in rural counties, O’Rourke barely budged the needle. Democratic senate candidates in the 11 contested races won about 35 percent of the rural vote. O’Rourke’s share of the rural vote was about 10 percentage points less. O’Rourke is an early Democratic favorite for 2020, it appears, largely because his skate-boarding, punk-rocking persona appeals to an urban electorate not because his 254-county strategy worked to turn out a surge of rural votes. The turnout was unusually high this November for a midterm election. That high turnout appears to be more due to Democratic votes than Republican votes. Democratic totals were down by just one half a percentage points from 2016 in states with competitive Senate races. Republican votes were off by 17.1 percent from 2016. There was a normal decline of Republican votes while Democrats summoned a presidential year surge. Republican vote declines were disproportionately rural. Democrats, on the other hand, gained votes in rural counties while losing very slightly in the major cities. Beto O’Rourke made gains in Texas for Democrats, but these gains were urban. Despite his statewide campaign, O’Rourke failed to make many inroads in rural Texas and he lagged other Senate Democrats in his share of the rural vote. O’Rourke’s strong challenge may have also spurred Republican voting, tempering the red ebb. The 2018 Texas Republican vote was down 9.4 percent from 2016, about half the average of the 11 states. Was the Democratic vote an increase in traditionally Democratic voters who decided to vote in a midterm election, or was there a significant crossover of Republican voters? And did Republicans stay away from the polls because it was a midterm election, or did they have a special distaste for President Trump’s style or policies? 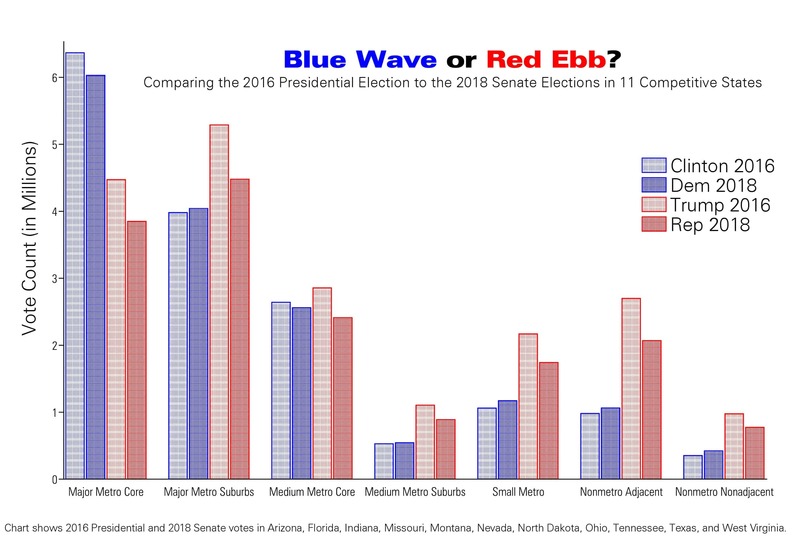 So, blue wave or red ebb? Take your pick and, while you’re at it, strap yourself to the saddle for 2020.